The gorgeous SU Flanker fighter in the colours of the Russian Knights stunt flying team belongs to the nobility of radio-controlled fighters. 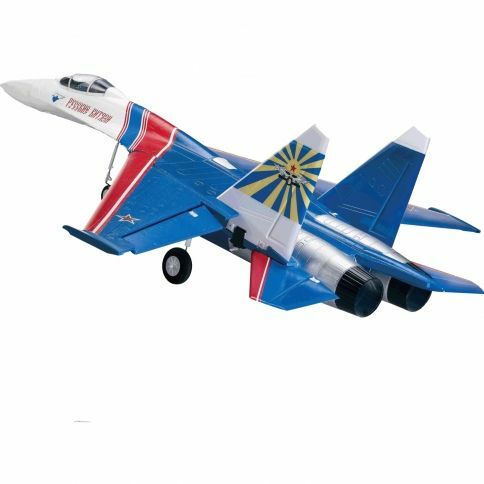 This high quality SU-27 Flanker is shipped in the colours of the Russian Knights stunt flying team and is almost completely assembled, so you get to fly in no time. The SU-27 Flanker is an exact copy of its real bigger brother. The plane is one of the best known fighters in the world and designed to carry out numerous different missions - and both air combat and surface attacks. Made of EPP foam and carrying two powerful brushless motors - there's no doubt the controls are fierce not to mention the speed. Yes, beginners should stay away from this 4-channel jet fighter. Also, it uses proper landing gear for both take off and landing. It is shipped with a 4-channel radio conroller, giving you full control of the aircraft.